We are pleased to announce a new educational initiative designed to build and deliver a statewide model for nursing preceptor education to support the provision of efficient, effective, patient-centered care through education, support, and integration of nurses in Maine. The importance of nursing preceptorship has grown in recent years as patient care is increasingly dynamic and complex. Precepting is described as a period of practical, guided training when a new nurse, or a nurse transitioning fields, applies the knowledge learned in school to clinical practice under the supervision of an experienced nurse. An effective nursing preceptorship program is vitally important to the health care landscape in Maine, as RNs between the ages of 52 and 71 comprise more than 47 percent of the nursing workforce and 52 percent do not plan to remain in the workforce five years from now (Maine State Board of Nursing). The anticipated retirement of the nursing workforce demonstrates an immediate need for quality precepting as a tool to prepare, transition, and retain new and transitioning nurses. The advisory team for this project is comprised of members from Maine Partners in Nursing Education and Practice, representatives from associate degree nursing programs and long-term care settings, and emerging nursing leaders in the state, and will focus on the future of an adequate nursing workforce to support health and aid in the continuum of care across Maine. 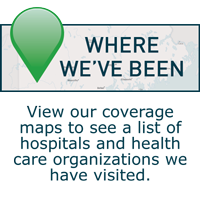 The program is currently in the planning and development stage and will be launched in 2015 on Lunder-Dineen’s online Learning Management System (LMS). In November, our Chief Learning Officer Gino Chisari, RN, DNP, was a featured presenter at the 7th Annual OMNE Annual Meeting, speaking on nursing leadership and healthy work environments. 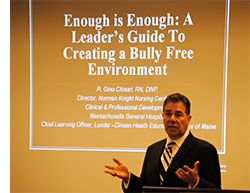 Dr. Chisari’s presentation Enough is Enough: A Leader’s Guide to Creating a Bully Free Environment was incredibly well received. OMNE is a professional organization that directs the course for nursing by promoting sound health care policies within our organizations and at the state, local and national level. To learn more about our nursing education, visit www.lunderdineen.org/nursing. ​The Joys and Sorrows of Older Veterans: Thoughts from a Geriatric Psychiatrist This webinar enhances practice for those working with aging veterans and their families. It focuses on capacities and challenges facing older veterans, the impact of post-traumatic stress disorder over the lifespan, and the ways in which works of literature can illuminate the traumas of war. This session is intended for social workers and licensed mental health counselors across academic and practice settings. 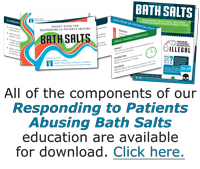 This session is intended for registered nurses. This session is intended for physicians, nursing professionals, social workers, and other clinicians who work with older adults.